A note from Lindsey: This film was viewed as part of TMP’s Barbara Stanwyck filmography project.This is the 34th film (and 36th role, if we’re including television) I’ve viewed from Stanwyck’s filmography. Dove (Laurence Harvey) and Kitty (Jane Fonda) meet in the dusty 1930s, while they’re both in Texas and wanting to get out of the state. They leave for New Orleans, where Dove is hoping to reconnect with his old love Hallie (Capucine), and meanwhile Kitty is hoping to win Dove over. Upon arrival in New Orleans, the pair turns up at a Mexican restaurant owned by Teresina Vidaverri (Anne Baxter), who is willing to let the travelers stay with her, even after Kitty attempts to steal from her. Dove soon finds Hallie, but learns that she’s working in a bordello run by a madame named Jo (Barbara Stanwyck). Edward Dmytryk directs 1962’s Walk on the Wild Side, a black and white drama based on the novel by Nelson Algren. 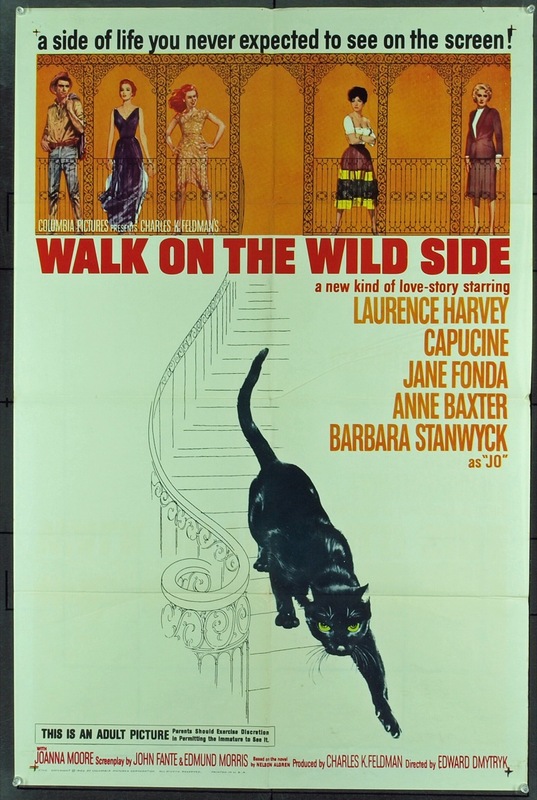 Quite appropriately, the film begins and ends with shots of a prowling alley cat. The film is notable because Barbara Stanwyck portrays what is said to be the first openly lesbian character in an American feature film. Jane Fonda’s character in this film draws the viewer in during the first scenes. She’s highly entertaining and Fonda does a good job in the role. But Kitty isn’t the only sassy character here: the film is full of them. Stanwyck is super snide in her character, and she gives a fantastic performance as usual, stealing the show though her role is somewhat smaller than the others. Anne Baxter’s character is probably the least catty of the bunch, and Baxter’s performance is quite a bit better than I expected it to be. Still, her accent is pretty hard to buy, which throws off her character a bit. The script of the film is a bit slow-moving, but I didn’t have a huge problem with the pace. It does have its dull points, but the variety of characters keeps it engrossing in general. And when the dialogue contains zingers like “You and that hip-slinging daughter of Satan!,” it’s hard not to love the film’s most melodramatic and tense moments. And melodramatic moments are plenty here, counteracting the dull moments nicely. There are a whole lot of twisted scenarios going on between these characters. Rounding off the film’s positive aspects is striking cinematography and a high-tension, unexpected ending.